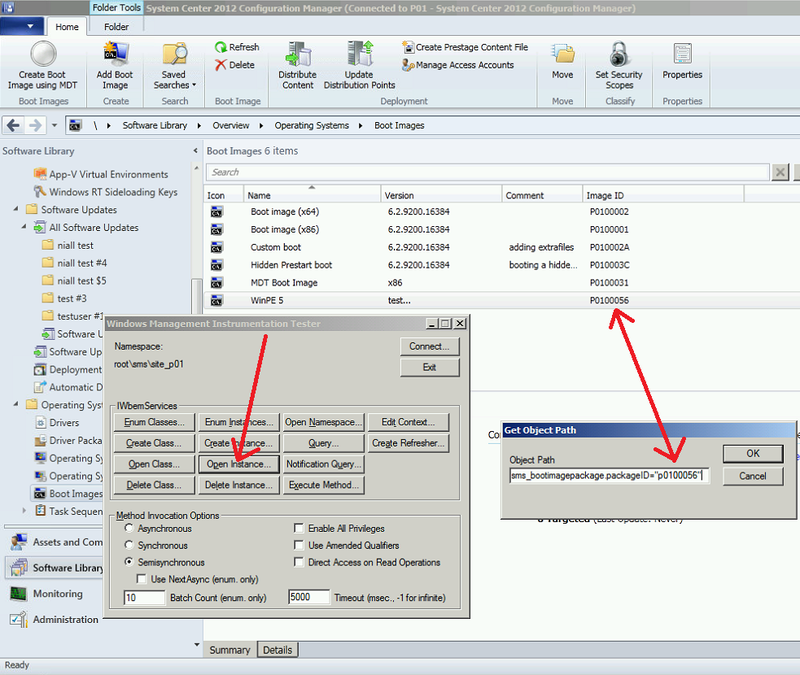 How can I manually add WinPE 5 boot images to System Center 2012 Configuration Manager SP1 CU3 ? | just another windows noob ? ← 2013 Microsoft® MVP Award! 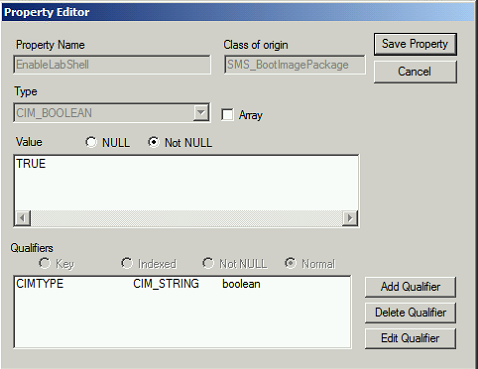 How can I manually add WinPE 5 boot images to System Center 2012 Configuration Manager SP1 CU3 ? but some things are not supported when it comes to Operating System Deployment such as driver provisioning. If you try to deploy Windows 8.1 using System Center 2012 Configuration Manager SP1 CU3 drivers will fail to install, below is a sample error logged in smsts.log when it attempts to provision drivers for Windows 8.1 using the built in WinPE 4 boot wim that Windows ADK 8 provides. This is due to the fact that System Center Configuration Manager 2012 SP1 uses Windows ADK 8.0 and that means the provided boot images are based on WinPE 4 which does not natively support Windows 8.1 deployments. 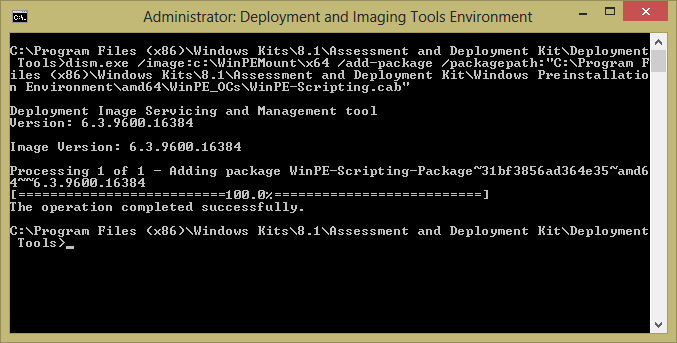 To natively support Windows 8.1 deployments you’ll need WinPE 5 boot images and they are included in Windows ADK 8.1. However Windows ADK 8.1 is not supported with System Center Configuration Manager 2012 SP1. This post will help you to manually create a WinPE 5 boot wim and add it to Configuration Manager to aid with deploying Windows 8.1 until R2 becomes available (GA is October 18th) or maybe you just have to wait before adding R2 in your organization. 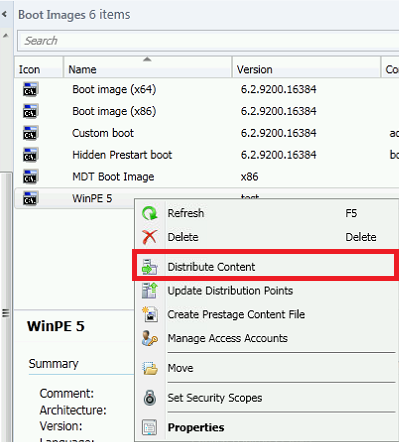 By manually creating a WinPE 5 boot image using the steps described below on a client computer and importing it into System Center 2012 Configuration Manager SP1 CU3 you can deploy Windows 8.1 operating systems. There are some caveats however listed below. 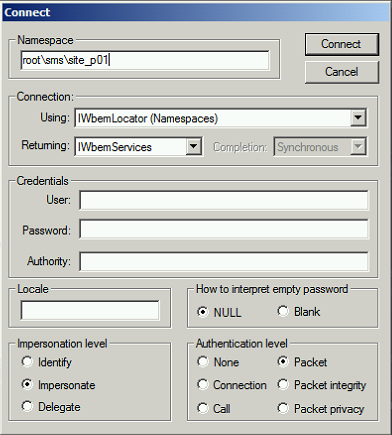 Optional Components or Drivers you manually add to the boot wim file will not be reflected in the Configuration Manager console boot wim properties. This is a comestic issue. It is not advisable to make any changes to the boot image via the console other than to distribute it to your distribution points. All further changes to the boot wim should be done using the process below. Please read the summary note at the end of this post for the Supported solution from Microsoft. Note: Failure to do the above will mean you are using the wrong version of DISM (unless you are doing this in Windows 8.1). Mount one of your new boot wim files using DISM, note the version of DISM in my screenshot below, if your’s doesn’t match then the rest of this tutorial won’t work. You can add features to Windows PE, such as languages, hotfixes, and support for features like PowerShell and the HTML Application Language (HTA). In Windows PE, feature packages are known as optional components. The commands for adding them are shown below, remove the ones you are not interested in. dism.exe /image:c:\WinPEMount\x64 /add-package /packagepath:"C:\Program Files (x86)\Windows Kits\8.1\Assessment and Deployment Kit\Windows Preinstallation Environment\amd64\WinPE_OCs\WinPE-Scripting.cab"
dism.exe /image:c:\WinPEMount\x64 /add-package /packagepath:"C:\Program Files (x86)\Windows Kits\8.1\Assessment and Deployment Kit\Windows Preinstallation Environment\amd64\WinPE_OCs\WinPE-WDS-Tools.cab"
dism.exe /image:c:\WinPEMount\x64 /add-package /packagepath:"C:\Program Files (x86)\Windows Kits\8.1\Assessment and Deployment Kit\Windows Preinstallation Environment\amd64\WinPE_OCs\WinPE-HTA.cab"
dism.exe /image:c:\WinPEMount\x64 /add-package /packagepath:"C:\Program Files (x86)\Windows Kits\8.1\Assessment and Deployment Kit\Windows Preinstallation Environment\amd64\WinPE_OCs\WinPE-MDAC.cab"
dism.exe /image:c:\WinPEMount\x64 /add-package /packagepath:"C:\Program Files (x86)\Windows Kits\8.1\Assessment and Deployment Kit\Windows Preinstallation Environment\amd64\WinPE_OCs\WinPE-NetFx.cab"
dism.exe /image:c:\WinPEMount\x64 /add-package /packagepath:"C:\Program Files (x86)\Windows Kits\8.1\Assessment and Deployment Kit\Windows Preinstallation Environment\amd64\WinPE_OCs\winpe-securestartup.cab"
dism.exe /image:c:\WinPEMount\x64 /add-package /packagepath:"C:\Program Files (x86)\Windows Kits\8.1\Assessment and Deployment Kit\Windows Preinstallation Environment\amd64\WinPE_OCs\WinPE-WMI.cab"
I add SMSTS.ini to my boot images to increase the logging sizes for SMSTS.log files (and other log files created during WinPE OSD operations). 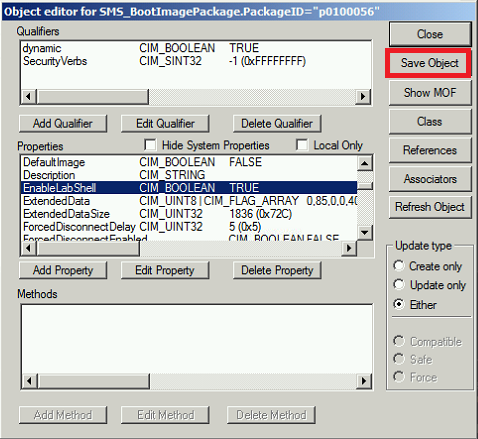 here’s a copy of my SMSTS,ini file, remove the .TXT extension before use. You’ll probably need to include some drivers in your boot wim, you cannot add them via the drivers tab in Configuration Manager as this boot image was created outside of Configuration Manager and with a different version of DISM. Now you are done creating the image, commit (write) the changes to it. 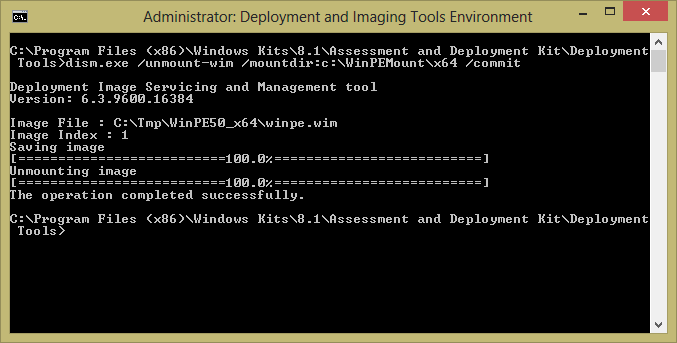 After creating your new WinPe 5 boot wim copy it to your Configuration Manager server source directory. You now want to add it via your Configuration Manager console. Right click on Boot images, choose Add Boot Image, follow the wizard. 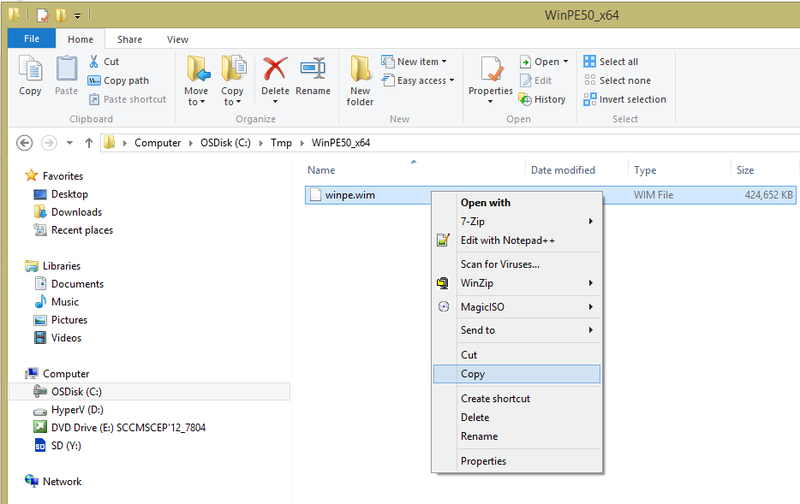 You can enable a command shell in the boot image to debug and troubleshoot it in WinPE. Use the following steps to enable the command shell. In the Configuration Manager console, click Software Library, expand Operating Systems, and then click Boot Images, locate the new boot image in the list and identify the package ID for the image. You can find the package ID in the Image ID column for the boot image. Click Open Instance, type sms_bootimagepackage.packageID=”<packageID>” where <packageID> is the package ID of your WinPE 5 boot wim. Click Refresh Object, and then scroll down until you can see EnableLabShell, select EnableLabShell in the Properties pane. It will be set to a value of FALSE. Once done you’ll see the value has indeed changed to True. 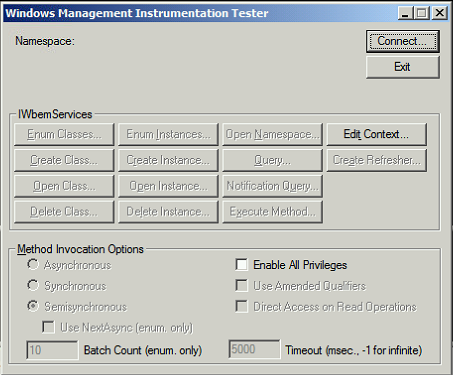 and then exit the Windows Management Instrumentation Tester by clicking on Close and then Exit. 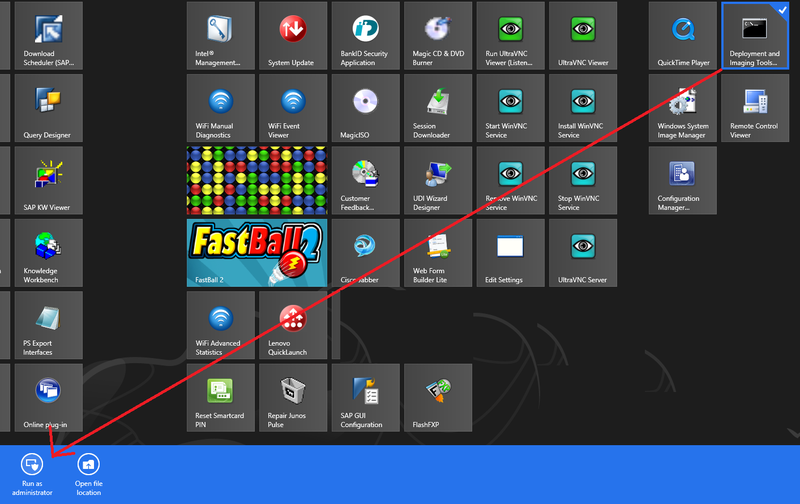 Select your new Deploy Windows 8.1 Task sequence, right click choose properties and choose Advanced, for the Use a boot image section click on Browse and browse to your newly added WinPe 5 boot image. 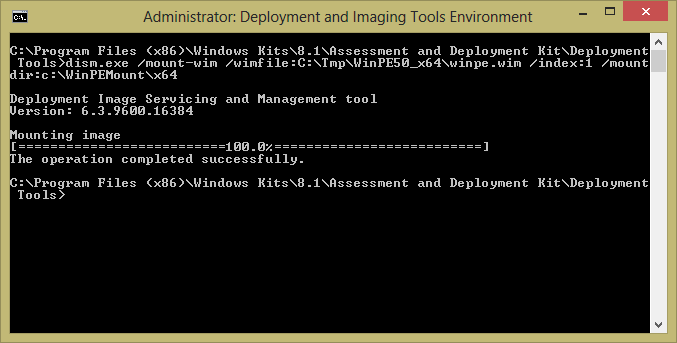 start deploying Windows 8.1 !! Although the above does help you to Deploy Windows 8.1 today, the supported solution from Microsoft is to use System Center 2012 Configuration Manager R2. That is due October 18th, 2013. 16 Responses to How can I manually add WinPE 5 boot images to System Center 2012 Configuration Manager SP1 CU3 ? Pingback: Findings in System Center 2012 R2 ConfigMgr - What's really new? Do you have any instructions for building a 32-bit PE5 boot image? I follow your steps to create the PE5.0 image, now the image is done, but can’t be added into a new Boot Images. Error shows “You cannot import this boot image – Only finalized boot images are supported”. Have any advices? Thanks a lot. please double check all the steps I listed, you should not be seeing that error, perhaps you are not using the ADK tools (and correct version of DISM). After reinstall cu3, the PE image worked, Thanks for the help. My source dir is not a network path. What DIR are you referring to?